Give me a break, give me a break, break me off a piece of that Kit Kat bar. because they come in adorable mini size. They're unwrapped and ready to eat! Whoever came up with the idea of mini candy bars was a genius. Minis are SO much cuter and make the best cupcake toppers! Preheat oven to 350 degrees. Line pan with cupcake liners. Sift cake mix into a large mixing bowl. Add eggs, buttermilk and oil. Using an electric mixer, mix until ingredients are all combined. Using a large cookie scoop, fill liners 2/3 full. Bake for 18-20 minutes or until done. Cool in pan for a few minutes and then place the cupcakes on a wire rack to continue cooling. 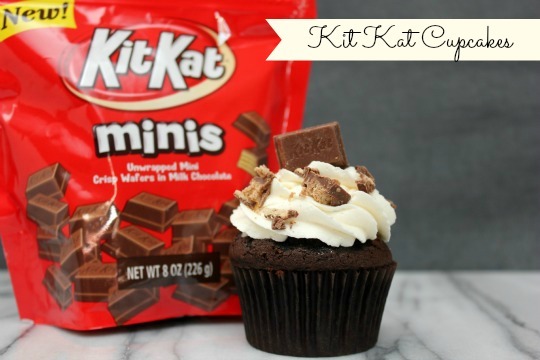 Top with chopped mini Kat Kat bars and one mini Kit Kat.